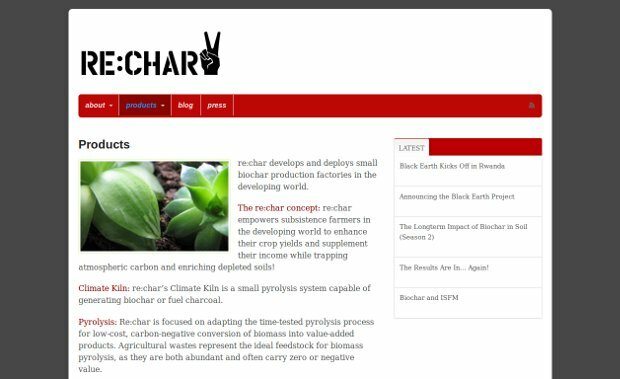 Re:char is a pioneering company that sells kilns to farmers in Kenya that allow them to convert their farm waste into what’s known as biochar, which can then be used for cooking. As an enterprise, Re:char seeks to deliver a “triple bottom line,” expanding the uses of sustainable alternatives for energy, providing a cost-effective solution for farmers in an effort to combat poverty, and stemming deforestation in Africa by encouraging use of biochar as cooking fuel instead of cutting down trees for firewood. Actually, it’s still a very new idea. There are just a handful of companies targeting different ends of the supply chain and it seems that some companies are trying to build multimillion-dollar plants to produce biochar. Jason Aramburu, the young CEO of re:char who just received a grant from the Gates Foundation to develop a system to transform human waste into biochar explained in an interview to Fast Company what is exactly his invention: “In the Amazon basin for over 3,000 years indigenous farmers have been making charcoal and burying it in the ground. They did this because it improved the soil’s ability to capture and retain nutrients, which led to increased crop yields. The soil is so fertile, that they call these sites terra preta, which means black earth in Portuguese. What the farmers didn’t know 3,000 years ago was that biochar was actually making a lasting impact on the soil. Today at the sites where they buried the biochar, it’s still in the ground. As a result of how fertile the land is, that biochar-rich land is worth about five times as much as the land without it”.